In most years, this piece would probably be the last one of the season but not so this time round. 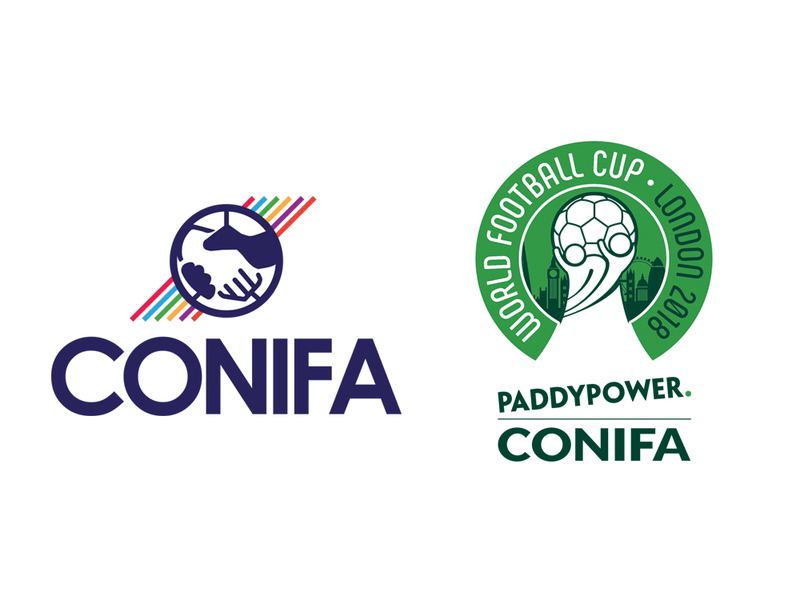 That's largely down to the fact that for the first time ever, London has been chosen to host the CONIFA World Football Cup. 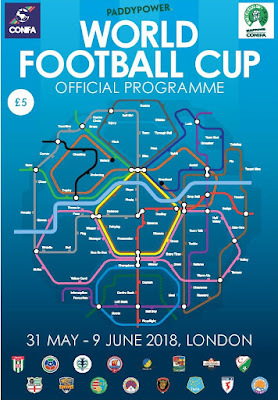 Kicking off in 10 days time, the event will pick up where the EFL play-offs leave off and extend the live action in the capital until 9 June - unusual in most years and exceptional in a FIFA World Cup one. Competitors in the 16-team tournament include Ellan Vannin (aka the Isle of Man), Northern Cyprus, Panjab, Tamil Eelam and Tibet - every continent bar South America is represented. There will be one or two familiar faces among the squads and former Premier League referee Mark Clattenburg is set to officiate at some of the games. Also on the refereeing side of things, a green card is also set to be introduced and will be shown to players guilty of dissent or diving - it will lead to them being immediately substituted. 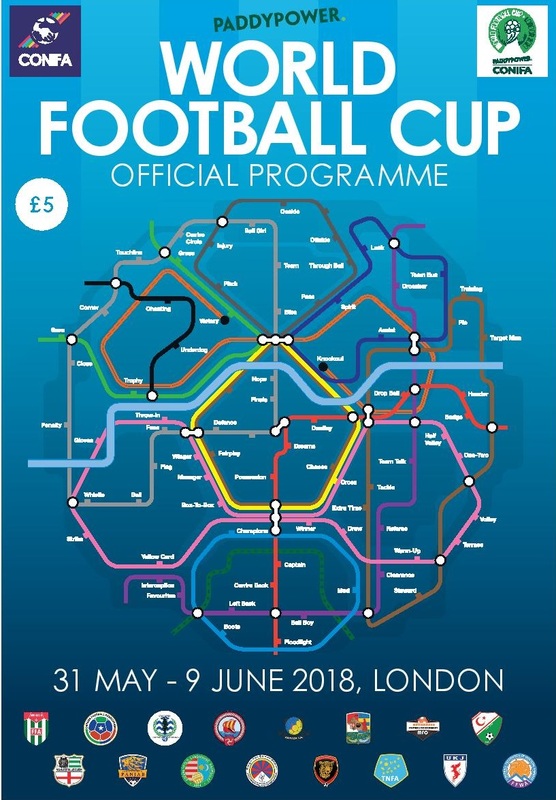 Matches are taking place at 10 different non-league grounds in and around London with the opening ceremony at Bromley on 31 May and final at Enfield Town on 9 June. As it stands, I'm hoping to go to Abkhazia v Northern Cyprus and Tuvalu v Matabeleland on 3 June, the semis on 7 June and the final on 9 June. How about you? If you are going to a game at the CONIFA World Football Cup, a documentary maker from the Netherlands would like to hear from you and film you at a game. Please get in touch with us if this interests you and we'll put you in touch. But before all that gets underway, we have the EFL play-off weekend at Wembley. Apart from the Championship game between Aston Villa and Fulham, tickets for the League One and League Two games should be pretty easy to get. With so much to play for, these games are usually highly charged and have a great atmosphere - try and get to at least one if you can. More details can be found in the Daily Digest below. Over the last few days, I made my third visit to Wembley in six weeks - this time for Non-League Finals Day. As usual it provided a feast of football and some great entertainment over the course of nearly seven hours - courtesy of the FA Trophy final going to penalties. Congratulations to Thatcham Town and Brackley Town for winning the FA Vase and Trophy respectively and my commiserations particularly to local side Bromley who were on the verge of winning the Trophy until a 95th-minute equaliser took the match to extra-time and ultimately penalties. The one sour note of the day for me was provided by a group of 20-30 young Thatcham fans right in front of our group who spent most of the game abusing and goading the Stockton Town supporters sat a few feet away across a handful of rows of seats. It was totally out of the spirit of the day and shamed their club. Thankfully their targets didn't rise to it and for the most part kept their dignity. So disinterested in the action were said group of 'supporters' that the abuse continued after the final whistle while their players were receiving the cup - very poor. Aside from all that, I also launched this year's Non-League Day last night with the announcement that this year's event will be on Saturday 13 October so put the date in your diary. Finally, it's nice to report some more good interactions with you dear readers. Regular correspondent Chris H was at Wembley on Sunday but also headed out to Greenford on Tuesday to watch PFC Victoria London clinch the Middlesex County League Division 1 West crown by virtue of goal difference alone! Congratulations to coach Emil and the team on your second consecutive promotion. 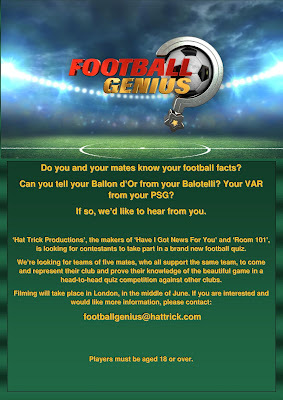 Lastly, do you fancy yourself as a bit of a Football Genius? If so then a new ITV quiz show is being launched by the same production company behind 'Have I Got News For You'. They are looking for teams of five who all support the same club to go head-to-head with supporters of other teams. 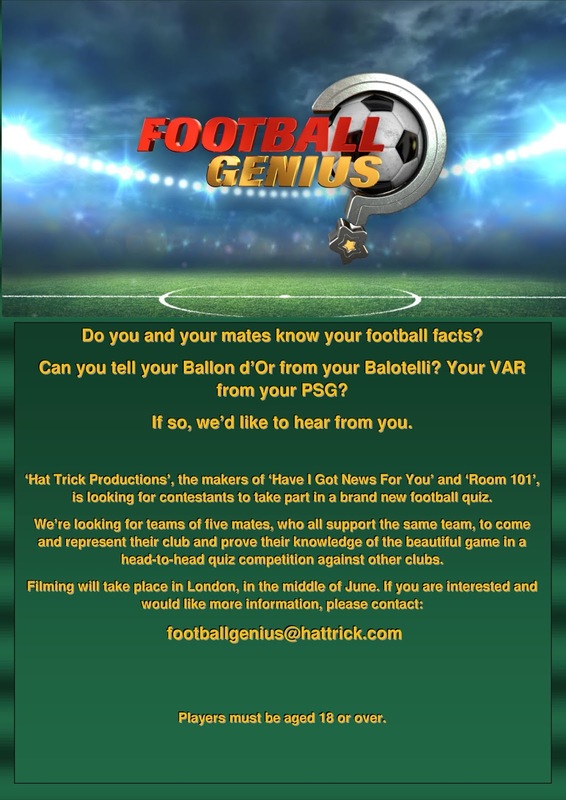 If you're interested get in touch with the production team via email (footballgenius@hattrick.com). Thanks this week goes to reader Markus U who gave a generous donation to the TLFG coffee-drinking fund. Thank you sir, much appreciated. I think that's about it from me for this week - as always, enjoy your football watching and let me know what you've been up to. There are 30 matches in the London area over the next two weeks. The highlights include an England international, the EFL play-offs and the group stage of the CONIFA World Football Cup. It is possible that some CONIFA warm-up games could be added too - there is supposed to be a tournament at Enfield Town on 26 May but the details are proving hard to come by. With games pretty thin on the ground, I've also included a few from the 11th, 12th and 13th tiers whose seasons are continuing for another week or so. These games are often played at fairly rudimentary grounds, with few facilities and can be particularly susceptible to a change of venue or kick-off time. United Koreans in Japan v Western Armenia @12pm- quarter-finalists at the last World Football Cup, UKIJ are one of the top challengers from Asia. With a squad based almost entirely in Japan, tournament sponsors Paddy Power have them at 6/1 to win the title. Western Armenia finished seventh at the last WFC but had some very close games with eventual finalists Abkhazia and Panjab. With players at a number of top division clubs in Armenia, Kazakhstan and Slovakia they could be dark horses at 25/1. A breathless group stage comes to an end on Sunday when all 16 teams return to action after less than 24 hours. This time four games will kick off at 3pm and four at 6pm. The top two in each group progress to the quarter-finals while the rest go into a separate placement 'tournament' to see who finishes in 9th-16th place - in other words no-one goes home early and each team has something to play for right until the final day. Padania v Szekely Land @6pm - the standout game pits two teams together who have a 100% record at this stage. Padania, hailing from northern Italy, have scored a staggering 14 goals in their two opening games and look like very serious contenders indeed. Szekely Land have scored nine themselves and have yet to concede. Made up of ethnic Hungarians based in Romania, Szekely have also been backed by some very colourful and vocal ultras who should create a great atmosphere. Both sides are already through to the next round but this will decided who wins the group. This match is being played at Bedfont Sports whose ground is worth visiting as it's based right next to the runway of Heathrow Airport so if you like football and planes it doesn't get much better than this! There are four other games to enjoy on Sunday and with the staggered kick-off times, it would be rude not to combine one of the above with one of the less eye-catching games. The easiest double would appear to be Abkhazia v Northern Cyprus at 3pm (Enfield Town) and then Matabeleland v Tuvalu at 6pm (Haringey Borough) - it's a pretty straightforward journey by train from Southbury or Enfield Town to White Hart Lane and then a brisk walk or bus ride to the ground - I'm going to be attempting this. Alternatively you could do it the other way around and watch Barawa v Ellan Vannin at 3pm (Haringey Borough) and Kabilya v Western Armenia at 6pm (Enfield Town). If you have a car then Karpatalya v Tibet at 3pm in Bracknell should be combinable with the Panjab game in Slough at 6pm or maybe the Padania match at Bedfont but it will be tight. The one game that would appear to be out on its own is Cascadia v Tamil Eelam over in Rotherhithe at 3pm. With the tournament developing every day, I will aim to update the guide as the competition progresses. Hello. I will be attending all three Cascadia matches in the ConIFA and am waiting for my accreditation for the 3 EFL playoffs. I've already done FA Womens Cup Final, games at Spurs, Chelsea and Arsenal, and the Saracens v Wasps semi final. Happy to allow you to take our content with a quick credit. Good work as always - love the map! Having been to none of the CONIFA grounds yet I was wondering: is there one you‘d personally recommend? From where I live I tend towards one in the South or West of London. Hi Markus - it depends what you're interested in. The most unusual is Bedfont Sports as it lies very close to the runway at Heathrow Airport and you get quite close to the planes. Sutton has a bit of character to it and has hosted some famous FA Cup ties over the years. I haven't been to Bracknell, Carshalton or Slough although I've heard good reports about all of them. It's also been a long time since I've been to Bromley and it has changed a lot. I'm hoping to check out Carshalton for the semis. Thanks very much, that‘s very helpful! Hi, I have a friend, Cristina Sferrazza singing for Padania at 6pm. I am singing in the afternoon in Portsmouth so not expecting to be able to attend. I would like to surprise her by attending, what is the ground like to get to, is it difficult from M25?